Baldr, son of Óðin, and the most gentle and most loved of the gods, suffered from nightmares. The Æsir, in counsel, could not unravel Baldr's dreams. Óðin himself decided to travel to Niflheim, the realm of the dead, to consult a seeress. 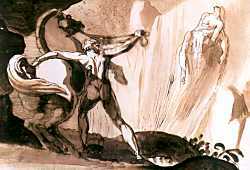 Óðin used his powers to raise the seeress from the dead. Óðin asked her four questions and learned that Höðr would slay Baldr with a fatal branch and that Váli would take vengeance on Höðr. With the fourth question, the seeress recognized her interrogator and refused to answer further. Óðin returned to Ásgarð with a heavy heart. The gods and goddesses thought of all the things that might harm Baldr. His mother, Frigg, traveled the nine worlds and convinced each and every thing to swear an oath not to harm Baldr. The gods made sport of testing Baldr's new safety. They threw darts and hacked with axes, but nothing could harm Baldr. Loki was envious of Baldr. In the shape of an old woman, he learned from Frigg that she had missed one thing: the little harmless mistletoe bush. Loki found a mistletoe bush and turned a branch of it into a sharpened dart. Returning to the company of the gods, Loki found them throwing missiles against Baldr in sport. To one side was Höðr, Baldr's blind brother. Loki asked Höðr why he wasn't joining in the sport. Höðr said he had no dart, nor could he see to shoot it. 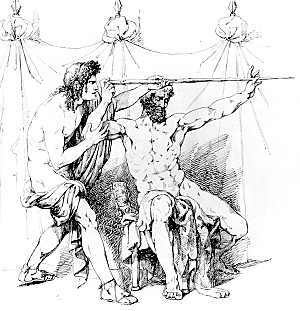 Loki gave Höðr the mistletoe dart, and guided Höðr's hand to throw the dart at Baldr. The dart flew through the hall and struck Baldr. It pierced him and passed right through him. Baldr fell over on his face. He was dead. The grief of the Æsir was bottomless; their silence was deafening. They knew who was responsible for the death of Baldr. Höðr could not see their fearsome gaze, and Loki could not withstand it. He fled. Goddesses began to wail and weep. Óðin was the most affected, since he alone knew the extent of the loss they had suffered and the sorrow and pain that would follow his son's death. Frigg begged for someone to ride to the kingdom of the dead to bring Baldr back. Hermóðr, another of Óðin's sons, agreed to make the trip. Óðin provided his horse Sleipnir for the journey. 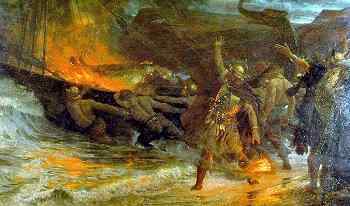 Meanwhile, Baldr's body was laid on a funeral pyre built on his ship, Hringhorni. Baldr's wife, Nanna, died on the spot from grief, and she, too, was laid on the pyre. Baldr's horse was killed and laid alongside him. Óðin took off his magic golden armring, Draupnir, one of the great treasures of the gods, and put it on Baldr's arm. So doing, he leaned down and whispered into his dead son's ear. The pyre was lit, and the ship pushed off into the sea. 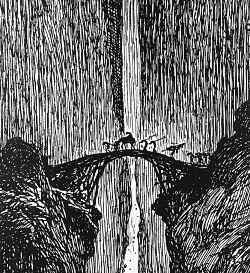 For nine nights, Hermóðr rode down the dark road to the land of the dead until he came to the bridge Gjallarbrú over the river Gjöll. Móðguðr, the maiden who guarded of the bridge, noticed that the bridge creaked more under Hermóðr than when five battalions of dead men crossed the day before, and concluded that Hermóðr was not yet dead. She asked what Hermóðr wanted in the land of the dead and confirmed that Baldr had crossed the bridge earlier. 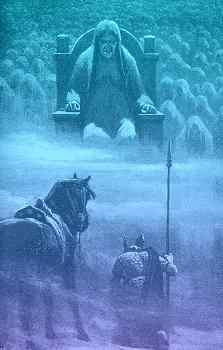 Hermóðr rode until until he came to the gates of the land of the dead. 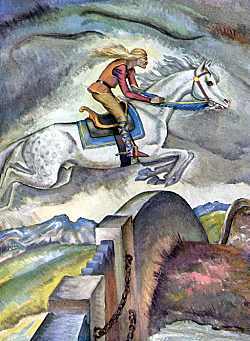 He spurred Sleipnir on, and the horse jumped completely over the gate. Hermóðr came to the hall of Hel, daughter of Loki, and ruler of the kingdom of the dead. Hel's face and body are those of a beautiful woman, but her thighs and legs are those of a corpse, mottled and moldering. Hel was willing to release Baldr on the condition that all things in the world, living or dead, would weep for him. Should any creature refuse to weep, then Baldr must stay with Hel and never return to the Æsir. Hermóðr took his leave of Hel and bade farewell to Baldr and Nanna, who gave him many gifts, including Draupnir, to give to the Æsir. On Hermóð's return to Ásgarð, the Æsir sent out messengers to all the nine worlds. All things did indeed weep for Baldr: men and beasts, stone and metal, in the way that these things weep when they are covered with frost and begin to thaw. The messengers of the Æsir came to a giantess alone in a cave. When they asked her to weep for Baldr, she replied, "Alive or dead, the old man's son has been no use to me. Let Hel hold what she has." Despite entreaties, the giantess would neither weep, nor say another word. The Æsir had no doubt that the giantess was Loki in disguise, seeking in his malice to keep Baldr with Hel. The Norse code of conduct required Óðin to avenge the death of his son Baldr. Using trickery and magic against an unwilling Rind, Óðin sired with her a son named Váli. The infant grew rapidly from the first moment of his birth. On the first night of his life, before he had even combed his hair or washed his hands, Váli came to Ásgarð and slew Höðr with an arrow. 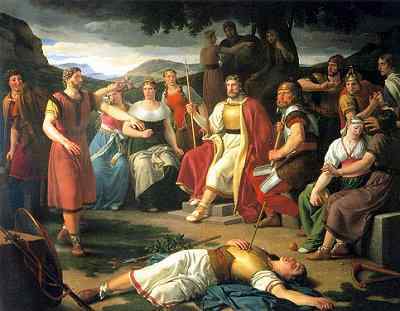 The story of Baldr's death is very old. 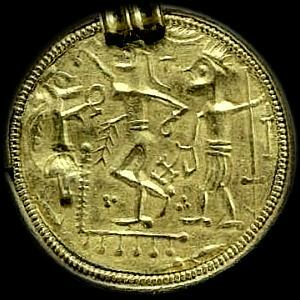 Images on gold bracteates from the 6th century illustrate the story of his death. The image on the bracteate shown to the left is thought to represent Loki, Baldr, and Höðr. One of the great mysteries of the Norse stories, and the subject of much speculation is the question: what did Óðin whisper in Baldr's ear? 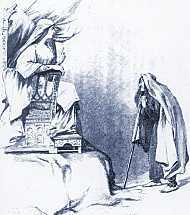 The poem Völuspá tells that Baldr's mother, Frigg, wept not for Baldr, but for Valhöll's woe. She recognized, as did Óðin, that the death of Baldr presaged the death of the gods at Ragnarök.